Leicester striker Chris Wood's late equaliser earned his side an FA Cup fourth-round replay against managerless Huddersfield Town. The Terriers sacked boss Simon Grayson on Thursday after a run of 12 league games without a win. Lee Novak rolled the hosts into the lead from the penalty spot after Lloyd Dyer upended Jack Hunt in the area. Foxes substitute Wood calmly slotted home Ritchie De Laet's low cross to send the tie to a replay. The result was a stark contrast to when the teams last met, on New Year's Day, when Nigel Pearson's side cruised to a 6-1 victory. Both sides made a number of changes, with Town making four to the team beaten 4-0 at Watford last week while the Foxes made five alterations to the XI that beat Middlesbrough 1-0 last Friday. 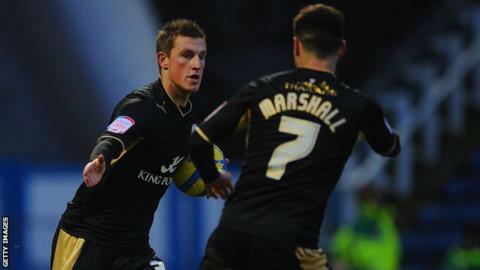 Chris Wood has scored 17 goals in 23 appearances this season. He has six in his last four starts for Leicester. Caretaker manager Mark Lillis will have been pleased with the energetic way his side started the match and they should have taken the lead when Peter Clarke met Oliver Norwood's cross but he failed to keep his header down. Neither goalkeeper was called into action in a first half where both teams struggled to create any clear chances, Martyn Waghorn going closest for the Foxes with a low volley from 20 yards that went just wide. The Terriers made a bright start to the second period and it took an excellent interception from Foxes skipper Wes Morgan to stop Novak opening the scoring from Hunt's cutback before James Vaughan fired an acrobatic effort straight at visiting keeper Kasper Schmeichel. This forced the Foxes into life and strikers Wood and David Nugent came on for James Vardy and Waghorn. New Zealand international Wood almost had an immediate impact but his curled effort from just outside the area was well saved by Terriers keeper Alex Smithies. The game was starting to open up and Novak should have put the hosts in front but he directed his header too close to Schmeichel and the visitors managed to get the ball to safety. Novak eventually got the better of the Leicester number one when he stroked home from the penalty spot after Dyer tripped the enterprising Hunt in the area. The hosts had chances to wrap up the win but Vaughan poked just wide from six yards while Clarke had a header cleared off the line by Danny Drinkwater. They were left to regret those misses when Wood showed good composure to slot home De Laet's cross after Dyer's neat dummy. The result brought to an end Leicester's run of five successive victories while Town have now won just once in 14 games in all competitions. "I just look at our performance and we were disjointed, we didn't pass the ball as well as we can. "We showed some good qualities to get back in it but a draw isn't an ideal result. Having said that I'd rather not lose a game. "We don't have a big squad but we have a fair amount of quality in there. "Give them credit, it was a very spirited performance. They chose to make a change during the week and it's always sad to see a manager lose his job." "It was a great experience for myself. I'm proud to have led the club in an FA Cup tie and to see them play like that. "I think they're the best team in the Championship and they showed us respect when they had to bring on their main strikers. "I wanted to get the boys passing again and I gave Jordan Sinnott a debut and I thought he was excellent. "I found out at 14:00 on Thursday what had happened and that I was being asked to lead the team." On whether he wants the job: "I'm academy manager and when they appoint a new boss that is the role I will go back to. My focus has just been on today and I'll speak to the chairmen later because we have Crystal Palace here on Wednesday."